Cut bean sheet to bite size. Deed fried the fresh been sheet till lightly golden. In a large plate combine cornstarch, plain flour, baking powder and salt. In a bowl, crack and whisk the eggs. Add the fried bean sheet into the flour, toss until all coated with the flour mixer. Transfer the fried bean sheet to the egg liquid; dip all of them in the egg liquid. Transfer back to the flour mixer and gently toss to coated, set aside for 30mins. Let the flour bind into the fried bean sheet. In a small bowl, mixed cornstarch liquid, orange juice and sugar, set aside. Scrape the orange along the grater from top to bottom to zest the orange. Cut into halve and squeeze the juice out. 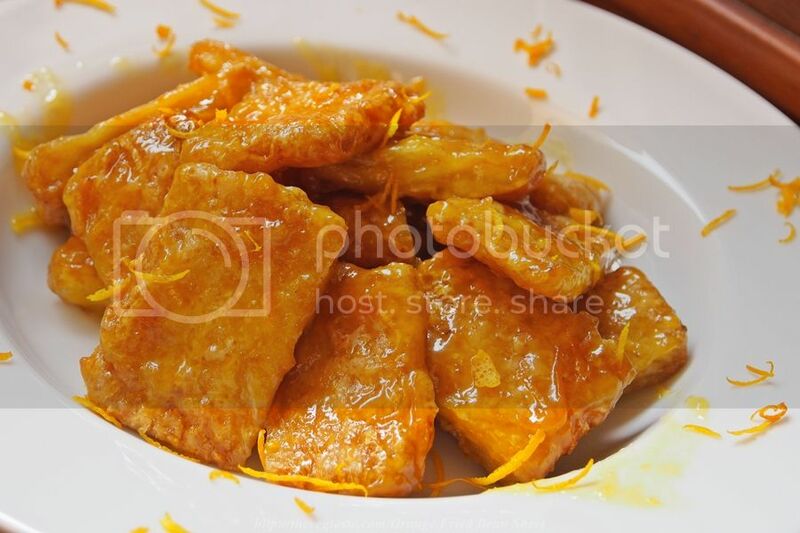 In a medium pot, heat oil, slowly drop part of the marinated fried bean sheet, fry till the flour form a crush and golden. Lift up and set aside. Drain the excess oil on paper towel. Heat wok with 1 tbsp of oil, add the sauce. Cook until thickening. Off fire. Add orange zest and the fried bean sheet. Toss to combine and serve immediately. I bought mine at a shop special selling vegetarian food. You can find it also at Asian grocery store tofu section. I bought mine at a shop special selling all kind of vegetarian food.